Doodling….One of the things about the replacement of long lazy phone calls with emails is the loss of doodling time. I could cover pages and pages with doodles while chatting. Maybe I should take up the art of zentangle one of these days. There are two weaving structures that I use that I like to call ”doodling on plain weave”. 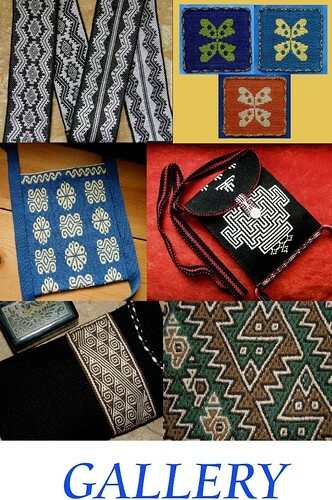 Both the warp-faced double weave technique and the supplementary- weft patterning that I know allow a lot of freedom for designing. Both are based on plain weave. The warp-float structures that I use limit design possibilities to a certain extent because the angle of the diagonal lines that they naturally create are quite often difficult or impossible to smoothly alter. The designer also has to keep an eye on warp-float length. A certain shape might be impossible to reproduce because it would require the inclusion of very long warp-floats. (Having said that, I have seen some nice curvy patterns created by a weaver in Argentina using the Simple Warp Floats Technique with fine thread). The black-and-white section of this piece is in the warp-faced double weave structure that creates two bonded layers of plain weave. You can find a page of this style of charting paper to download on my FAQ page here. This is the kind of charting paper that I used to chart figures and letters for the following lanyard project. This week I have been weaving a lanyard for my nephew who competes in triathlons. I chose the warp-faced double weave structure and 60/2 silk. The silk would give me lots of threads in a small space so that I could create relatively detailed patterns. The double weave structure would give me the freedom to create curve-like shapes for the little athlete figures as well as give me the sturdiness that a lanyard requires. I wanted to weave a favorite inspirational quote of his along with symbols representing a swimmer. cyclist and runner. After weaving a sample last week, I made some changes to the original plans and got down to charting the figures. It was fun. I was relieved, when I finally wove the piece, to find that the althletes’ heads and bicycle wheels actually looked circular rather than egg-shaped. 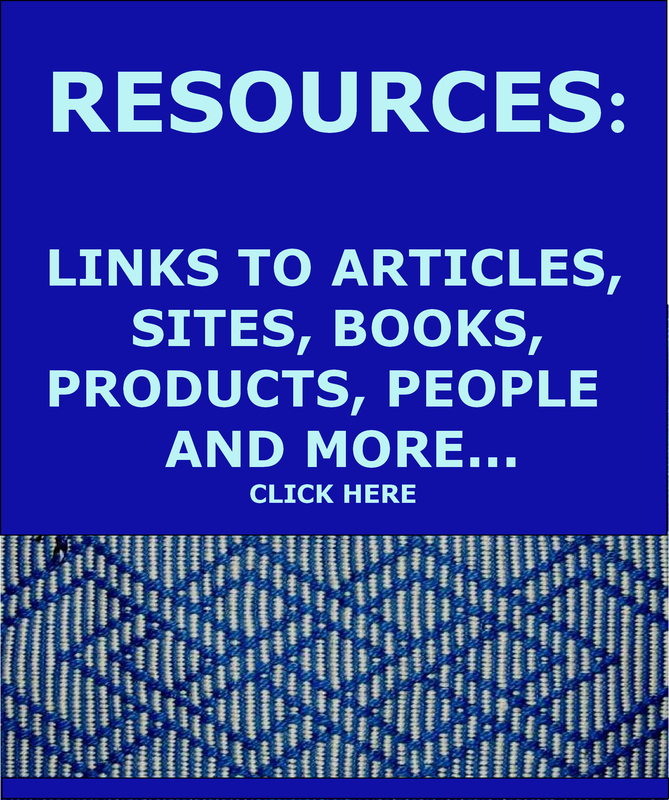 I am guessing that some of you have seen my tutorials for these two ”doodling” techniques – warp-faced double weave and supplementary-weft patterning –and are perhaps using them in projects of your own. I figured that even if you haven’t, you may enjoy seeing how the charting process works for me. I decided to show you how I would go about charting a very simple leaf. While, I can doodle up pages of nonsense, and copy things reasonably well, I am not at all talented at drawing from scratch. So, let’s make this leaf pattern as simple as possible. There it is…a very basic shape as close to symmetrical as I could manage. I added some detail in the form of veins but didn’t go overboard! You can probably make out my first erased attempt to transfer the drawing on the left. In the end, I cut out the shape from the drawing paper and traced around it on the chart. Yep, that’s how poor I am at drawing. Then, it was just a matter of filling in the oval cells that lie closest to my traced outline. You can see my examples on the left of diagonal lines ascending at various angles. These are just a few examples of the way diagonal lines can be depicted on these charts. At this point, it is probably better to put the original drawing out of sight. The charted motif will never look like the original because you simply cannot produce a real curve on this kind of chart. It is best to just work with what you have from here on rather than be continually comparing the charted motif to the original sketch. Once I had one side of the leaf drawn in, I could just fill in the cells to match on the other half. Now to add the details. I sketched in the veins…that was easy. The center vein is a vertical line. I can’t create a true vertical line on this kind of chart. Below, on the left of the leaf, you can see a couple of options for creating what will appear pretty much as vertical lines when woven. I used the thinner one for the vein of my leaf. Now I can dare to bring back the original and see how I like the comparison. I am happy with it. I even managed to squeeze in some extra vein detail. So, I drew it again, filling in the shape and leaving the cells for the veins blank. 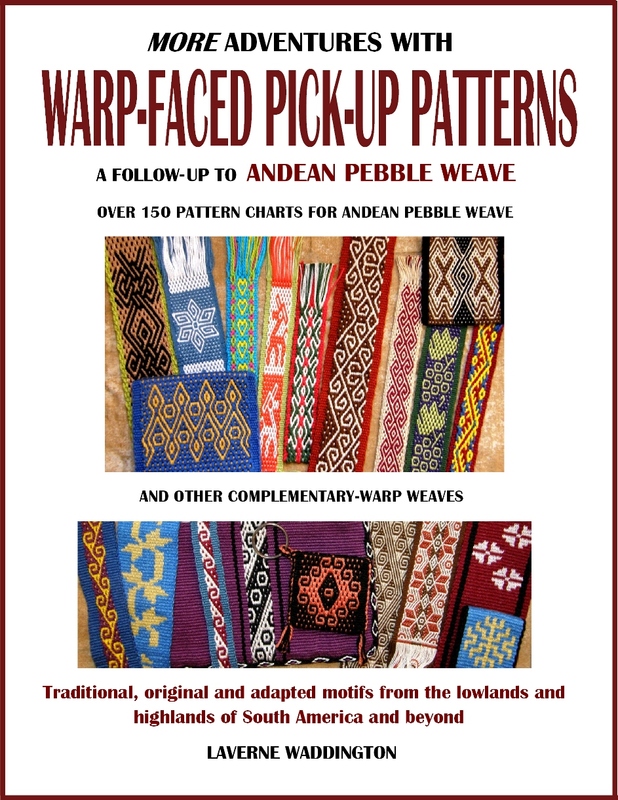 Now, this pattern chart is all set to go for warp-faced double weave. I just need to choose my thread and colors and go wind a warp. However, I realized that I might one day want to use this same charted motif for supplementary-weft patterning. I use the same style of chart for both structures. There could be some problems if I decided to use this charted motif for supplementary-weft patterning if I planned to use heavy-ish thread. Horizontal lines on the chart will become weft floats in that technique and those that are indicated by arrows above might be awkwardly long and impractical. It does, of course depend on the weight of yarn you are using for the plain-weave ground. I have had floats that span up to 17 warp threads without any problems when using 60/2 silk, for example, but I have also used heavy cotton on which floats that span more than 6 warp threads are ugly. So, I decided to alter the chart to eliminate the floats that span more then 6 threads by making the leaf veins a little longer. 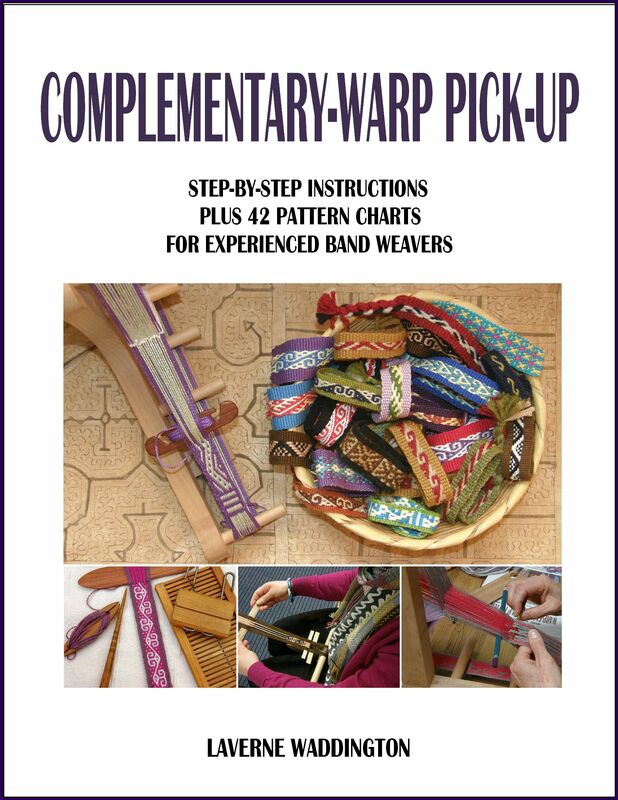 Now I have a dual-purpose chart….one that works equally well for both double weave and supplementary-weft patterning. I like two-fers. Sweet! And, because it is double weave, I can decide if I want to look at the face that has a white leaf on green or the face that has the green leaf on white. I wove the leaf a little to the left so that I could have a staggered line of them veering from left to right and back again. I can even reverse the background and motif color as I go if I want both color options to be seen on one face of the band. 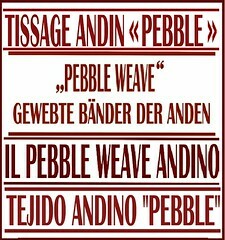 One thing to keep in mind, is that several weavers could work from the same chart yet produce motifs that look quite different. For example, a weaver who has a light beat might produce an oval shape while the weaver with a heavier beat produces a circle working from the same chart. One weaver may tend to have his/her warp threads pushed more closely together than another. That’s why it is always a good idea to weave a small sample while you are still designing to see if the proportions of the figure you weave match those of the figure on the charting paper. From there you can make adjustments if necessary. That is one of the many great things about backstrap weaving. You can wind the tiniest warp for this kind of sampling, like the one at left, sample quickly and continue charting. Perhaps you will be encouraged to do some doodling of your own. I look forward to seeing what you create.